Add one more to the DPO files. You might notice I've made a lot of posts lately memorializing post offices that have been... lost. I make an active effort to seek them out, especially if I can find out about them in advance. Sadly, they are all too many of them. Despite the fact that there are only 36,000 post offices in the United States, compared with about 115,000 at the postal service's peak, thousands will continue to close. Ironically, those closings will mostly occur in the communities that need them most: small rural towns and depressed urban neighborhoods. In any case, I've always said that I consider the post office to be the embodiment of many a community. So I think an article is a fitting tribute. And besides, I've not yet 'posted' about my visits in Oregon! DPO'd (my coined verb for 'discontinued post office'): Solomon Courthouse Station; Portland, OR. It's yet another 'Hit List' facility. Date of visit: March 2010. Last day of service: 1/28/11. See the USPS News Release here. Why was it closed? My suspicion is that nobody knew about it. It's not that the post office was incredibly difficult to get to; it's just that nobody knows where it was or even that it existed. 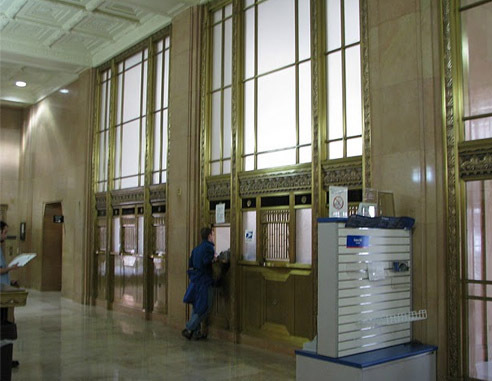 As this fantastic article from 2004 notes, the building chosen for this downtown Portland post office is a protected national historic landmark. Meaning? It's incredibly difficult to, say, mount any signs on the exterior of the building. Beautiful building, no? It would be a shame to deface it, I suppose. It seems they might have had sidewalk signage, as seen here, but I sure never came across any. I arrived at the post office toward the end of lunch. (It was a one-man operation, meaning the post office closes for a lunch hour or two.) By the time it reopened, there were five people in the line -- myself included, for postmarks, of course. Footsteps in the hall echoed with grandeur; the Gus J. Solomon United States Court House was a public work built in the early 1930s. A post office had resided in the Pioneer Courthouse, a few hundred yards away. That lasted for over 125 years until 2003. Solomon, too, had a previous iteration of its own post office; it was replaced by University Station in 1984; now University Station has once again absorbed its operations. Reputedly (or, according to the article above), University Station has some long lines.